A rich Italian meat sauce recipe made with beef and pork with layers of flavor perfect over pasta or in lasagna. I need y’all to listen to me for a minute. Like, I need you to hear me and believe it in your bones when I tell you this. This sauce is one of the most amazing things I’ve ever cooked in my whole life. Ever. And you can put that on page one. And take it to church. I knew what Bolognese sauce was. Well, I thought I knew what it was. I thought it was just like regular ol’ spaghetti sauce but with more meat. This sauce is more about the meat and layering of flavors and less about the tomatoes. The tomatoes are really insignificant in this sauce. You cook this for hours uncovered so that the sauce reduces and the flavors really intensify. I did a ton of research before I hashed out my recipe. I had no idea Bolognese had milk in it. Or white wine. I found recipes that used both red and white wines but the more reading I did, the more sure I became that white wine is not only more authentic but actually tastes better because the brightness of it works beautifully with the rich meat. I did some comparison research online but most of the information I based my recipe on came from one of my favorite cookbooks of all time, The Italian Cooking Encyclopedia. I’ve had this book for about 15 years and I go to it time and time again. It’s chocked full of facts about authentic Italian cuisine and traditional recipes. I can’t tell you how many times I've curled up on the couch with this book and a cup of coffee or a glass of wine. Season ground beef and ground pork with salt and pepper to taste then brown in a Dutch oven or stock pot until cooked through. Drain fat from meat then set meat aside. To the same (now empty) pot add butter, carrots, celery and onion and sauté over medium heat until onions are semi-translucent (about 5 minutes). Add salt and pepper to taste and minced garlic then continue cooking for 2 minutes. Add cooked ground meat to pot with veggies and mix well. Stir in milk and nutmeg. Simmer, uncovered, over medium-low heat for one hour or until most of the liquid has evaporated. Stir occasionally and adjust heat such that you maintain a very gentle simmer during this time. Add white wine, tomatoes (with juice), Italian Seasoning, 1 teaspoon salt and garlic powder then stir well. Simmer, uncovered, over medium-low heat for 2 1/2 hours, stirring occasionally. Cover the sauce and remove from heat before cooking your pasta to let the sauce rest a bit before serving. 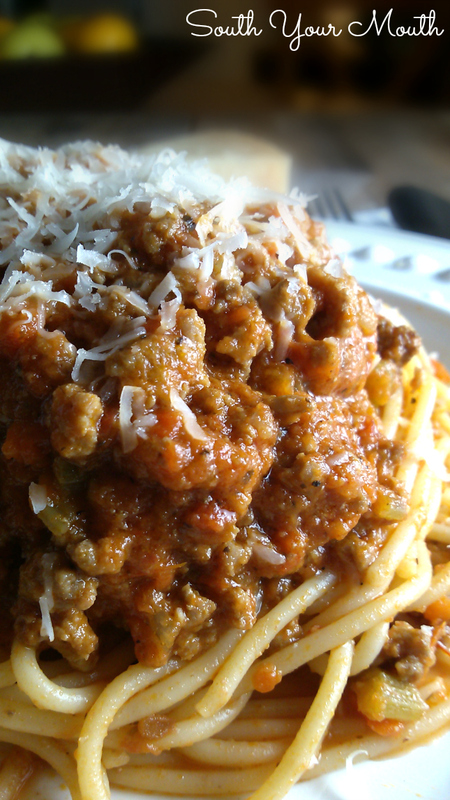 Bolognese is traditionally served with pasta strands (tagliatelle, spaghetti, etc.) or rigid tube pasta (rigatoni, penne, etc.) but any pasta will work! I find that I want more sauce than I usually have when eating traditional spaghetti sauce (because it’s SO flipping good, y’all). I use a box grater to shred my carrots instead of trying to finely dice them because it’s so much easier but feel free to finely dice yours. You can’t use a cast iron pot or skillet (enamel covered cast iron is fine) with recipes that include wine (or vinegar or lots of tomato sauce or anything else highly acidic) as the acid will react unfavorably with the cast iron. [UPDATE] Within 24 hours of publishing this recipe I've received several comments and emails asking what to substitute for the wine so I thought I better add this note. It is my opinion that there isn't a substitute for the wine in this recipe. I think it's just too important as it brightens the flavor and balances the richness from the butter, milk and meat. You can certainly leave it out if you like but I do not think the sauce will taste as good. Chicken broth would not be a good substitute as the only thing it has in common with wine is that it's wet. This is my all time favorite sauce (gravy) even though Putanesca comes second!!! Yummy!!! What besides wine can you use? We don't drink in our household so to buy a bottle of wine just to use in this sauce would be a waste. Do they have "mini" bottles? That would have an about the amount I would need for the sauce so there wouldn't be waste. I've seen little 4-packs of small bottles in stores. They would be perfect as you can save the other bottles for another recipe. How about white grape juice ? If it is the alcohol you are worried about, be assured by cooking it to a boil the alcohol evaporates out. I also am not a drinker, haven't touched the stuff in over 30 years. I cook with wine all the time and never had it affect me in anyway. This recipe sounds (and looks) soooo good, with one exception - and it's just a personal thing with no criticism intended: This is probably a "sacrilege" to anyone who enjoys cooking with (or drinking) wine, but I really dislike the taste of wine and it has been my experience in tasting something with wine in it, that is the overpowering taste that jumps out on my taste buds and thereby ruins the dish for me. Is there anything that can be substituted that will not ruin the authenticity of your recipe? If not, can you explain what kind of wine one looks for, i.e., a table wine or cooking wine, for example and what brand constitutes a "dry" white wine? I'm willing to give it a try if it is deemed a "must" for this recipe to be a success. You can tell my level of expertise on wine is sub zero! My apologies to the good cooks out there for my ignorance. I'm so excited to try this recipe. I am not a wine drinker but do love it in cooking recipes. I usually buy the little 4-pack bottles that I can use in other recipes. Like "Anonymous," I am not a wine-drinker and hate the taste of it in food. (Unsophisticated? Yep, that's me.) This sounded so good, though...had to try it. I substituted beef broth & it was DELICIOUS. Mandy, love your site...keep up the great work! Thank you, Lori!! I'm glad you enjoyed it! I made this last night and it is fantastic! Mandy thank you for doing all the "tweaking" on your recipes, it is so nice to just chop, measure and simmer and not have to think about doing my own "tweaking". I added a parmesan rind to the final simmer because I had one on hand, and swapped the ground pork for Mild Italian sausage because I couldn't fine ground pork. I am making this as I write. Did anyone run into a problem of the milk curdling? after most of it evaporated i added the tomatoes and I added red wine since I had that on hand. As soon as I added it, the small out of milk leftover looked like it curdled some. I'm not using a cast iron pot. Is this supposed to happen? It didn't happen to me but one of the articles I read when researching this had a note about. That it's OK if it happens and to just keep stirring. That the sauce will come back together. I'll see if I can find it! Thanks!!! It did come back together. Took a bit longer than the recipe called for but it came out great!! Thanks so much ! Keep on posting these great recipes! I have on occasion used like 1 tbs. red/white wine vinegar instead of 1 cup wine, just for a bit of brightness. Try with 1 tsp., increase as needed. 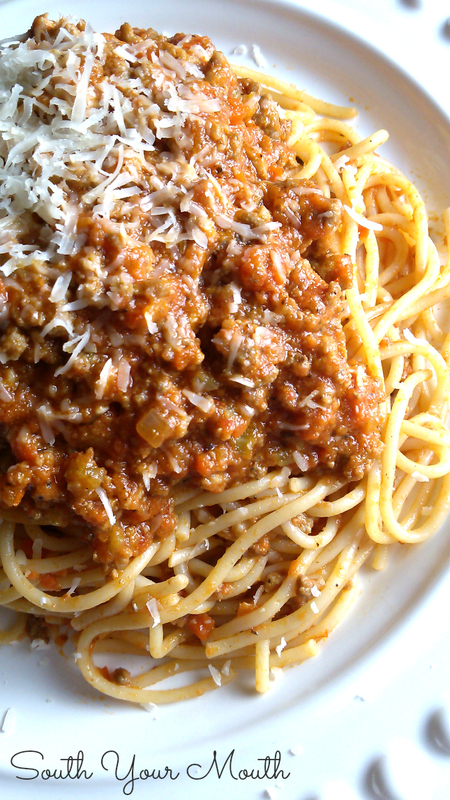 Love Bolognese but prefer a "hardier" pasta, my favorite is potato gnocchi. Much of the time wine is added to recipes so that alcohol soluble flavors are highlighted, and much of the alcohol is cooked out of the sauce, especially with a 2+ hours cooking time. what about the cooking wines they sell like Marsala or something. Would one of those work as a substitute for the wine? Do you think for the simmering part a slow cooker uncovered would work? My range doesn't have a setting low enough not to scorch. I have everything but the wine and will pick that up tomorrow and cook this ASAP. I used my oven at 350ºF. I'm going to leave it in a little longer, but so far it tastes EXCELLENT! This recipe really turned out tasty. I made a few change ups based on my experience with other recipes. I started with bacon lardons, browned them and removed. Added the vegetables and then basically followed your ingredients and process. I added the bacon bits back in before simmering for the 2 1/2 hrs. Drove my wife and I crazy with the aroma! Very good! The BEST recipe ever! Making it the second time right now! Yummy! i am in the middle of this & just realized that i don't have nutmeg? is that a big deal? Thank you for the recipe. I've made it so many times and each time, my family devours it. It's beyond delicious. Made this the other day. It took a while to make and was skeptical of the results, however my family loved it! I will definitely make it again! This recipe looks fabulous! I can’t wait to make it but I wanted to ask you about the white wine, I don’t drink wine but I want to buy some for this recipe, what white wine should I get? Do I buy cooking wine or regular white wine? They say never cook with wine that isn't good enough to drink ;) I usually use chardonnay. Any $8-$10 bottle will be just fine! Hey! Have you used these sauce for lasagna? That's what I'm doing. Wondering how it turned out. Thanks!